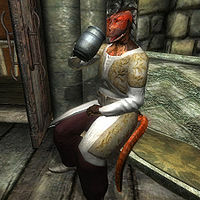 Pad-Ei is an Argonian rogue living in Bliss, New Sheoth, where he is a permanent resident at The Choosy Beggar. Except for his exaggerated friendliness, Pad-Ei seems more or less normal, at least compared to the other citizens of Bliss. He does not do much in life and spends most of his time wandering around the ground floor of the Choosy Beggar while chatting with the innkeeper Raven Biter. He eats lunch at the inn for two hours at 12pm and dinner for three hours at 6pm. At 2pm, he ventures outside to pay Dumag gro-Bonk a two-hour visit over at The Missing Pauldron. He never sleeps, but wanders around the inn all night long. He always wields an enchanted dagger of the best possible quality and carries around a strong potion of healing and a leveled amount of gold. His wardrobe consists of a grey tunic with burgundy linens and brown loafers. Pad-Ei also knows the standard leveled Rogue spells. When he sees you, he will either say "Hi there, Sparkles. ", "Hey there, Chief." or "How are you, pal?" but when you approach him, he will only say: "Whadda you need?" even though he doesn't offer anything but the occasional rumor. He will bid you farewell with a strange: "Pleasant dreams." If killed, Pad-Ei, like a few others in New Sheoth, will not be given a tombstone in the New Sheoth Graveyard. According to the construction set, Pad-Ei was supposed to suffer from a rather odd insomnia, causing him to stay up all night long; the recorded dialogue lines "What do you need, Sparkles? I'm always here. Can't afford to sleep. Can't be too careful." (listen) and "So far, so good. If this world's a dream, I'm not waking up." (listen) will never be heard in the game because the "Whadda you need? "-greeting takes precedence.